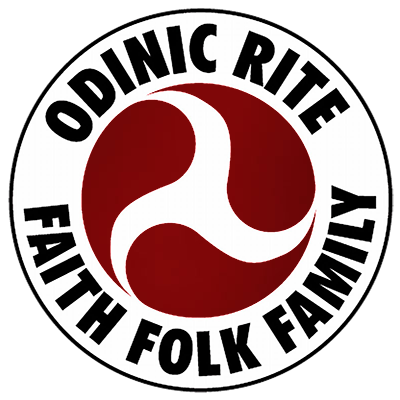 ODINISM as the organic faith of our folk has evolved from a shared experience around the central pillars of and in accordance with the moves of the great creative forces identified as gods. One aspect of this is reflected in the deep reverence we give to our ancestors and to nature itself. In the same way as the organic religions of other ethnic groups, such as Shintoism, Odinism is both a religion of ancestor worship and a nature religion. Of course, it is broader than this and has multiple facets so it reflects every aspect of northern life. It can be called a martial religion since the virtues of the warrior are highly regarded, but equally it could be called a peaceful fertility religion. It also has its mystical path and shamanistic traditions. In short it is a vast system which encompasses all that our folk has experienced and continues to experience. Occasionally there is a tendency to place too much emphasis on a single aspect and this limits its truly multiversal scope to operating somewhere between fixed and narrow parameters. Hence at one stage it was thought by many to be purely a ‘warrior cult’, with little other expression. This view is, happily, now largely defunct; it has been shown that this is only one of its manifestations – important, yes, but not exclusive. Others have found only the runic aspect worthy of study. These days it is usually non Odinic Rite members who suffer these delusions, as we who are restored to our faith realise the immense range that Odinism covers and do not lop off convenient sections merely because they appeal to us or help to satisfy our fantasies. There is sometimes a danger for present-day heathen folk to lay too much stress on the past to the detriment of the present and future. Odinists realise that all are vital strands in the web of existence. This imbalance in looking exclusively to the past is usually manifest in a desire to live and act as our ancestors did, literally and physically, or to be more precise, how it is believed that they lived and acted. This is a highly selective exercise, as no one wants to recreate all the personal discomforts that would have been suffered in the good old days. Certain supposed elements of our forebears’ lives are taken and garnished liberally with nostalgic romanticism and held up as examples of ‘real’ heathenism and ‘real’ Odinism. I stress this physical aspect because the central spiritual essence of our faith, our codes of ‘rightness’, are timeless qualities, but the physical world in which they are projected is an ever-changing place. A simple example would be the warrior. Although a modern warrior would experience the same emotions as one from the past, his weaponry would be greatly different. This may not be wholly desirable but it remains a fact of our material existence. It is just not possible for us to live as our ancestors lived and, in terms of advancing our faith, absolutely futile even to try. Our ancestors often faced a grim struggle for daily existence, hunger stalked the land during the iron-hard northern winters and it was the drive and determination to overcome these problems-that has led to our far more materially comfortable existence today. Unfortunately for the. great mass of our people this advance in material things has led to a withering of and separation from our spiritual and folkish values. This century has perhaps seen the greatest separation of all. Certainly we are reaping the harvest of the consequences. We see the degenerate and the perverse prosper, the corrupt’ rule our lands. Neither can we raise our hands against these wrongs as in times of old as by equally perverse twists the forces of law and justice guard the very dregs we would wish to eradicate. It is tempting in these bleak times to look back to a better age for comfort and to emulate those who lived in it. There are sometimes a few individuals, nearly always on the outer edge of the Odinic resurgence, who insist that in order to conduct ‘real’ Odinist Blots we have to be out in some remote spot. This is both illogical and historically unsound. It is certainly true that some rituals (e.g. Naming) can only be conducted out of doors. It is also true that open air Blots are inspiring and therefore to be encouraged. But indoor Blots are equally valid. There is no historical evidence for Odinic worship having been an exclusively out-of-doors affair. The Great Hof at Uppsala was a man-built edifice with a permanent staff of gothar. Alcuin mentions in his Vita Willibrodi a temple to Forseti. Many chroniclers and folktales mention temples, often beautifully furnished, dedicated to our Germanic deities. Contact with our folk soul reveals this. Our people lived their faith then as we should do today. Then as now the home was a holy place. Surely no Odinist would suggest that we leave our gods at the door or they us? Our gods are where we are. To say they dwell only in the wild places limits and debases them. Is there any person today who does not regard the home as a holy place to restored northern folk? Our Blots begin with a hallowing which re-states the holiness of the place where they are held and consecrates its use to our gods. Some open-air sites are used by all manner of deviants who invoke dark and alien forces; our homes never suffer this. Blots were once often attended by the entire family as today – hopefully – at Hearth moots. Would parents of the past really have taken children, even babes in arms, nursing mothers or the frail elderly out in freezing temperatures or pouring rain? Of course not. And if children are left behind while the parents go off to worship, someone has to stay with them. Straight away the family participation has gone. We may ‘feel’ more religious out of doors. Admittedly it is easier for us to gain an increased sense of religious awareness at some special site, but this has more to do with our own approach to holiness than with holiness itself. And if it were indeed true that only open-air Blots are ‘correct’, which it quite obviously is not, that would also mean that we would have to travel there in the mode of our ancestors – on foot, by cart or horse! Again, I state that although some rituals have to be held in the open, this cannot affect the validity of the indoor Blot. On land or at sea, in field or forest, at hearth or in home, in cave, grove or Hof, wherever good comrades meet or the lone Odinist celebrates, we honour our gods and our kinfolk and they reach out to us. So let us celebrate life wherever we be and grasp their outheld hands.